Throughout Europe, the shortest night of the year is celebrated in wildly diverse ways; but in Portugal and Spain, festivities continue well into the morning’s early light. Soft shadows dance from crackling bonfires and the savory smell of grilled meats, sardines and fresh bread give a rustic setting that’s highlighted by booming fireworks for the Festa de São João (Portugal) and Fiesta de San Juan (Spain). Both festivals celebrate the birth of Saint John the Baptist, and both are infamous for their all night parties. These fantastic festivals have a rich background in old pagan holidays for the summer solstice, or midsummer. This was a time to celebrate fertility, crops and was associated with joy and abundance. Later it was adapted to the Christian faith by the church and became known as St. John’s day. Some of the more spectacular traditions were kept intact in the shift from old to new such as the large fires, feasting and general merriment. In Porto, from June 23 to the 24, the long used tradition of beating passers-by on the head with leeks (a symbol of male fertility) has since been replaced by plastic toy mallets and garlic flowers, but women placing the lemony verbena (symbolic of female fertility) on the face is still in practice. Pots of peppery manjericão (basil) with popular sayings can be found dotting the cityscape alongside crackling bonfires. At midnight, a fifteen minute long firework display over the beautiful Douro river, considered amongst the best in the world, is easy to see. Spain, from June 20 – 24, has its own Hogueras de San Juan (Bonfires of Saint John). The coastal city of Alicante, where the largest celebration is held, displays blazing bonfires that can be found along the Mediterranean and scattered about the city streets. Here, many structures used for burning have become much more elaborate than just a pile of dry wood. Instead, since the late 1920’s, these pyres have been inspired by the traditional Falles celebration used in Valencia. These fires aren’t just for looks, many people leap over the fire to both purify their souls and burn away their troubles. The Spanish midsummer festivals aren’t limited to Alicante, but can be found in just about every major city and town across the country. The only difference is the name it’s called by, such as Sant Joan in Catalonia. Equally, in Portugal, we can find the very popular festival of Santo António (Saint Anthony) in Lisbon. While each country has its own practices when it comes to São João and San Juan, fire is the one thing that seems common to the two; another similarity is the love of food. The notably fat succulent sardine grilled to perfection can be found cooking over an open flame on nearly every street corner. 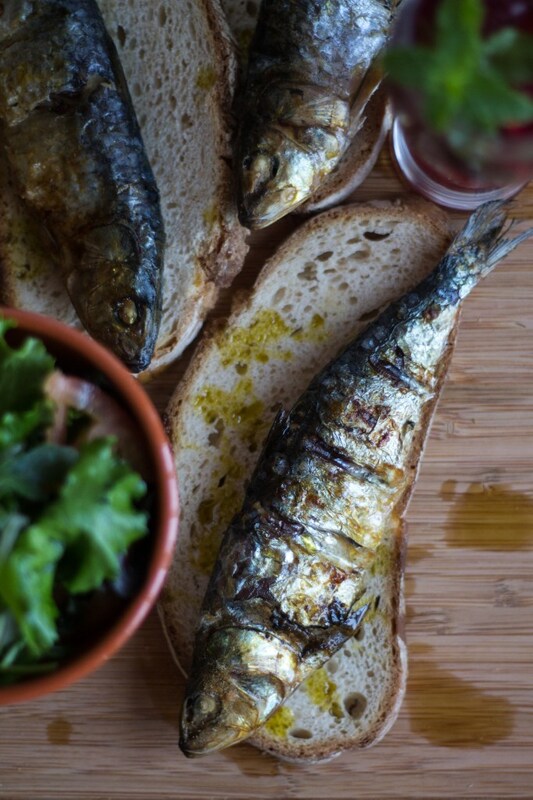 Sardines are loved throughout the Iberian Peninsula and the fresh ones are favored by all. Usually all that’s needed is some hot coals, a sprinkle of salt and a drizzle of sweet local olive oil. The sardine is so prevalent in the Portuguese mind that they have a saying “Puxar a brasa à sua sardinha” which literally translates to “Pull the coal to one’s sardine” meaning to defend one’s personal interests. So go out and pull those coals to your sardines and celebrate the shortest night of the year. Run cool water over the sardines and brush the outside of the fish with your hands to help remove loose scales. Transfer the fish to a large tray and drizzle with olive oil and sprinkle with salt. Turn over the sardines and repeat with the other side. Cover with paper towels and set aside. Prepare a barbecue with wood charcoal and set on fire. Once the flames have died down and the coals are glowing red hot, lay the sardines on a grill grate with the fatter fish towards the back so they get the most heat. Allow to cook about 5 -7 minutes on each side or until the skin is browned and the fish is fairly firm to the touch. If you don’t want to cook the sardines whole, you can ask your fish monger to clean them and remove the guts or you can do it at home. Serve these with slices of rustic bread (served on the bread for Lisbon style), alongside some boiled potatoes with grilled red peppers (traditional to Porto), or with a fresh Portuguese salad and sangria to quench that summer thirst!